Breaking News: Pope Francis Visits America! No doubt some news or comment on this event may have reached some of you some of the time last week, unless you do not have any connections to the outside world. That sentence suggests the next one: you don’t need Sightings to comment in detail on the visit, news and images of which we enjoyed and applauded. Today begins the work-week after that epical or epochal or at least memorable and provocative event. This week we begin to observe and appraise after-effects. Again, you don’t need Sightings to point to the polar positions of commentators. They appear in abundance. Our interest is in what critics of institutions would call the “institutional consequences,” since the Pope came with an agenda that included accents on pastoral activities, evangelization, and—as many newspaper accounts made clear in close-ups—on local parish life. While Pope Francis was generous in making ecumenical gestures and comments, he could not fail in any case to be of interest to Protestants, Jews, evangelicals, and members of all kinds of religious communities among them and beyond them. 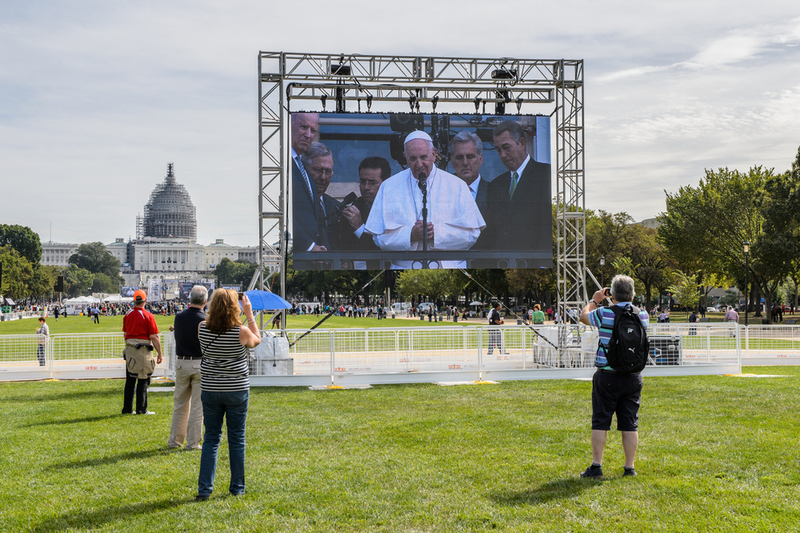 Many on-lookers used words like “rock-star” or “celebrity” to describe the pope as an attractor. Such words may be a bit crude, but they signal something to which to pay attention. Rock-stars have audiences and claques and clubs, and fans come and then go when the celebrity wears off. Religious leaders seek communities and congregations; not simply awed admirers but agents of change who base their action on something with which the noted visitor left them. To put it baldly if not boldly: religious celebrity wears thin and wears out quickly. Major figures to whom the Pope referred as models, however—Abraham Lincoln, Martin Luther King Jr., Dorothy Day, and Thomas Merton—were builders of community (even from the distance of monasteries, as did Thomas Merton). Social scientists can tell us, and provide evidence in support of their telling, that behind the massive crowds last week, there were life-times of workers and networkers who attend mass or other communal rites; who build seminaries and tend to them; teach the young, care for the sick and, even if scandal often afflicts them, generally model actions of care. For background this week, I unearthed references to previous papal visits, notably to Denver and “World Youth Day” during Pope John Paul’s visit to Denver in 1993. The source listed below may be somewhat biased and cheer-leading, since it appeared in the National Catholic Register, which favors activities of mainly conservative Catholic movements and looks for good news. Discount the claims somewhat, if that feels right, but notice the up-beat sense of what the pope accomplished on that Denver visit where 223,000 young people showed up. I wanted to study effects on my own, but could not find evidence of new vocations among the Catholic young who admired the pope. Mass attendance nationally did not grow; it continued its decline. All the statistics in Catholicism (and Catholic-friendly ”other” churches) failed to give evidence for new devotion, prosperity or resolve. However, I may have missed something, so, to be fair and helpful, I’ll simply suggest that readers of Sightings follow up by accessing and reading the National Catholic Register accounting, and doing their own watching for effects of the visit. Sanchez, Victoria. “Priest remembers Pope John Paul II visit.” Colorado's KUSA 9News, September 21, 2015.http://www.9news.com/story/news/local/2015/09/21/denver-visit-pope-john-paul-ii/72600618/. Laugesen, Wayne. “Looking at the Good Fruit of World Youth Day Denver ’93.”National Catholic Register, August 23, 2013, Daily News.http://www.ncregister.com/daily-news/looking-at-the-good-fruit-of-world-youth-day-denver-93. Zoll, Rachel. “How the Catholic Church in America Is Doing on the Eve of Pope Francis’s Visit: There’s good news, and there’s bad news.” AP/HuffPost Religion, September 21, 2015, US. http://www.huffingtonpost.com/entry/how-the-catholic-church-in-america-is-doing-on-the-eve-of-pope-franciss-visit_560055fbe4b0fde8b0cf4153. Goodstein, Laurie. 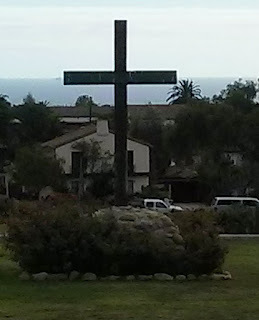 “Pope Francis to Find a Church in Upheaval: Some U.S. churches are bursting with immigrant parishioners, while other struggle to stay open.” New York Times, September 21, 2015, U.S. http://www.nytimes.com/2015/09/22/us/pope-francis-to-find-a-church-in-upheaval.html?_r=0. Image: Pope Francis, Washington D.C. (Sept. 24, 2015); Credit: Anton_Ivanov / Shutterstock.com.